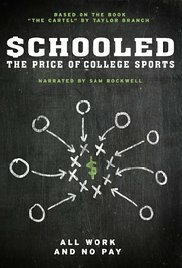 Questions and heightened interest led me to publish an expanded e-book before the end of 2011, The Cartel: Inside the Rise and Imminent Fall of the NCAA. The e-book contains new chapters on subjects such as the NCAA’s growing power in academic supervision and its reluctant role in Title IX sports for female athletes. Producer Andrew Muscato enlisted me along with NFL Players Association President Domonique Foxworth to make a documentary film, “Schooled: The Price of College Sports.” The EPIX network aired the film in 2013, featuring Jay Bilas, Ed O’Bannon, Joe Nocera, Sonny Vaccaro, Bob Costas, Arian Foster, and antitrust lawyer Michael Hausfeld, among others. Scholars and sportswriters still yearn for grand juries to ferret out every bauble that reaches a college athlete, but the NCAA’s ersatz courts can only masquerade as public authority. I drove down for the [Iron Bowl], into the throbbing heart of college sports…Before dawn on game day, a sleepless caller babbled over fan radio station WJOX that he “couldn’t stop thinking about the coin toss,” and pilgrims packed the Bear Bryant museum all morning. [Bill] Russell developed a theory that every sport seeks its blend of art and war. He saw beauty in Muhammad Ali and ferocity in cute gymnasts breaking bones to win. The NCAA makes money—and enables universities and corporations to make money—from the unpaid labor of young athletes. All this is accomplished by fiat. There is no statutory justification at all, whereas even slavery, for all its horrors, was debated and codified in straightforward detail. The fans at one road game somehow discovered Tiny’s minuscule SAT scores, which they waved on signs as they taunted him with singsong cries of “Re-tard!” [Tutor Brenda] Monk’s nostrils flared. “That’s the only time I ever thought about going up into the stands,” she sighed. Amateur rule dissolved in the Olympic cradle where it had been born, and the world did not end. Indeed, most people scarcely noticed. A fairy-tale version of the founding of the NCAA holds that President Theodore Roosevelt, upset by a photograph of a bloodied Swarthmore College player, vowed to civilize or destroy football. The real story is that Roosevelt maneuvered shrewdly to preserve the sport—and give a boost to his beloved Harvard. A thousand questions lie willfully silenced because the NCAA is naturally afraid of giving “student-athletes” a true voice.